EventBooking was named the winner of a Bronze Stevie® Award through the Annual American Business Awards, in the Communications / PR Campaign of the Year category. 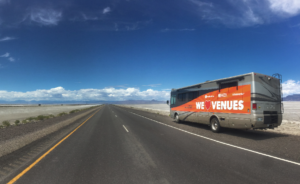 Their winning PR Campaign was the unique Road to VenueConnect road trip, in which three staff members toured the nation in an RV to have face-to-face discussions with venue professionals in 18 marquee venues across the country. At each of the 18 stops, EventBooking facilitated round-table discussions to explore how they could further evolve their software to be a “dream tool” for those in the venue and events industry. The trip ended at IAVM’s VenueConnect 2017 in Nashville and was covered by the touring group in Facility Manager magazine. A division within the Stevie Awards, The American Business Awards are the United States’ premier business awards program. All organizations operating in the country were eligible to submit nominations for the awards that were presented in June at a gala ceremony at the Marriott Marquis Hotel in New York. More than 40 pages of notes were collected as a result of hearing feedback from over 150 venue professionals. All notes were organized, archived, and presented to the EventBooking software development team so the most popular ideas could be acted upon / programmed into the software. Media coverage of the journey included the four-page feature article in Facility Manager Magazine, an online feature in IQ Magazine, a live guest appearance on IAVM’s monthly podcast The Venue, as well as a 20-minute speaking opportunity on the IAVM trade show floor as part of VenueChat.